The Vancouver Canucks are a team that many (including myself) expected to be a lottery team. Not only this year, but in future years as well. As of the time of writing this they are in the 2nd wild card spot with 26 points in 24 games played. Now, their advanced stats suggest they may still partially be playing over their head. However, give them credit because they are playing much better than most expected. There are a few reasons for this. New coach Travis Green seems to have implemented a solid system that is working. They also had a very good offseason that got overshadowed. Acquiring guys like Burmistrov, Pouliot, Gagner, Vanek and Del Zotto all have just made the NHL roster better than it was last year. A huge reason for their success though? The emergence of their young guys playing big minutes. Bo Horvat leads all forwards on his team at 5v5 ice time. Now he only has a CF% of 48%, but a HDCF% of 51%. Brock Boeser has 22P (11G 11A) in 21GP this year. Also while Vancouver takes a lot of flak for drafting him so high, Jake Virtanen currently has a 55CF%, and really should start seeing some more pucks go in soon. 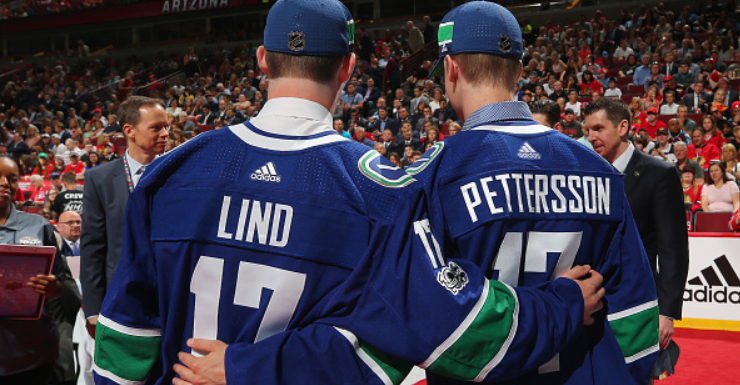 These 3 players all look like they are going to be anywhere from good to elite for a long time, but the question was, “Is this enough to build around?” Well, the Canucks have quietly stocked up a nice prospect pool to go forward with. Let’s start by taking a look at their latest first round draft pick http://gty.im/800235772 . Pettersson could arguably be the best player in this past years draft, and may be an absolute steal at #5. Pettersson is leading the SHL in points as a 19 year old, with 28P in 21GP. He is also in first in PPG with 1.33. For comparison lets take a look at league to league scoring. This is saying that for every point in the SHL, it is worth .58 of an NHL point. Pettersson’s 28 points would be around 16.2 in the NHL. This puts him on track for a 63 point season in the NHL. Sweden is one of the top leagues in the world and to be a 19 year old dominating like that is something special. He is absolutely blowing away the U20 competition too. The next U20 player in points? Possible 1st overall pick Rasmus Dahlin. He currently has 10P in 21G (as a defender). Pettersson looks like he could and should be a massive skill player in the NHL in the near future. With Pettersson taking #1 in exciting prospects, lets look at a few others. Lets start with the forwards. Kole Lind currently has 32P in 20GP in the WHL. He was their 2nd round pick (33rd overall) this season. Another strong looking choice that good possibly make the lineup in the next few years. They also have Nikolay Goldobin who has put up two 40 point years in the AHL, and should be at least an NHL player. They got him from a trade with San Jose that saw Jannik Hansen go the other way. Another huge trade was accquiring Jonathan Dahlen from the Senators in return for Alex Burrows. Burrows was a fan favourite for Vancouver, but this trade has Erat for Forsberg written all over it. Dahlen and Forsberg both played in the Swe-1 league. As a 19 year old Forsberg put up 1.15PPG in that league, Dahlen currently has 1.28PPG. This is an exciting young player Canucks fans should be excited to watch grow and develop. Rounding out the forward prospects they have Gadjovich, Gaudette, Boucher, and Chaput. None of these guys look like studs, but most are around or above PPG in their respective leagues. There is a possibility they make the NHL, although if they do it may be in a depth role. Still good prospects to have around. Next, let’s move to the defence pool. This is admittedly not as exciting as the forwards. However, they do have Olli Juolevi. He looks like a very promising defence-man who is having success in Finland this season. The Canucks drafted him 5th overall last season, and he looks like he should be a part of their core moving forward. In terms of the rest of the D, nothing really flies out at you. They have a couple other guys in Candella and Brassard who are both playing in the OHL. Their numbers are not stunning, although Candella’s look good enough. Nothing to me jumps out as a “must watch prospect” which is fine. I also haven’t watched either one enough to know if fans should be looking out for them or not. Losing Nikita Tryamkin to the KHL was a big blow, and if he ever decided to return that would be a big boost on the backend. Lastly, lets look at the goalie pool. There are only two guys really in this pool but oh wow are they exciting. First of his Thatcher Demko. Demko looks like he should be the Canucks starter in just a matter of years. The 21 year old posted a .920 – .935 SV% 3 years in a row in the NCAA, and is currently at .922 in the AHL. He has tons of potential and it really should only be a matter of time before he takes over the net in Vancouver. Their other interesting goalie is Micheal DiPietro. DiPietro was drafted in the 3rd round of this years draft (damn what a draft). He has a .914SV% in the OHL this year, which ranks him 3rd for goalies with at least 10 games played. Furthermore, he posted a .917 last year and a .912 has a 16 year old. Those are some damn fine looking numbers. He’s only 6 foot which is smallish for goalies, and part of the reason he fell to the 3rd round. However, this is another player Canucks fans should keep their eye on, he could be something special down the road too. Overall, the Canucks have a solid looking pool. With already a few solid youngsters in the NHL adding talent like Pettersson, Dahlen, Juolevi, and Demko should make these guys a pretty competitive team in the near future. They could still use another top pick or 2, and a good young defence-man. Rasmus Dahlin would look nice on this team, but overall Benning and the Canucks have done a good job restocking. It will be interesting to see what they do as they approach the deadline. If you could move the Sedins for a big package return back would you? The Canucks have taken a lot of flak over the past few years, and I think they are starting to show maybe they don’t deserve all of it.